Colombia and Venezuela haven’t always been the best of friends over the last 15 years, since the late Hugo Chavez swept to power. 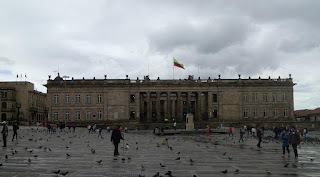 However, here in Bogota, the Oilholic finds relations between the two neighbours at an all time low, largely down to a select bunch of “chiflados oportunistas en Caracas” (loosely translated as opportunistic crackpots in Caracas), who blame everyone but themselves for the effects their own mad economic policies, say locals. But first some background – A general election is slated for 6 December in Venezuela with oil nowhere near the three-figure per barrel price the country needs to balance its budget. Regional analysts fear a sovereign default and monthly inflation according to independent forecasts is in double figures as Caracas hasn’t published official data for a while (even the fudged version). Meanwhile, industrial production is in doldrums as the government continues to print money. The Venezuelan Bolivar’s official exchange rate to the dollar is VEF6.34, but you’d be lucky if anyone in Bogota or elsewhere in Latin America would be willing to exchange the greenback for VEF635; forget the decimal point! Price controls and availability have played havoc with what Venezuelans can and cannot buy. More often than not, it is no longer a choice in a country that famously ran out of loo rolls last year. So what does President Nicolas Maduro do? Why blame it all on “conspirators” in Colombia! Now hear the Oilholic out, as he narrates a tale of farce, as narrated to him by an economics student at the local university, which this blogger has independently verified. With the Venezuelan Bolívar more or less not quite worth the paper its printed on – as explained above – most of the country’s citizens (including Chavistas, and quite a few regional central banks if rumours are to be believed) – turn to DolarToday, or more specifically to the website’s twitter account, to get an unofficial exchange rate based on what rate the Bolívar changes hands in Cucuta, a Colombian town near the border with Venezuela (The website currently puts the Bolivar just shy of VEF800 to the dollar). It is where Venezuelans and Colombians meet to exchange cheap price-controlled fuel, among other stuff from the false economy created by Caracas, to smuggle over to Colombia. The preferred currency, is of course, the Colombian peso, as the dollar’s exchange rate to the Bolívar is calculated indirectly from the value of the peso with little choice to do anything else but. The final calculation is extremely irregular, as the Colombian peso itself grapples with market volatility, but what the fine folks in Cucata come up with and DolarToday reports is still considered a damn sight better than the official peg, according to most contacts in Colombia and beyond, including the narrator of the story himself. So far so much for the story, but what conclusions did President Maduro take? Well in the opinion of the Venezuelan President, DolarToday is a conspiracy by the US, their pals in Colombia and evil bankers to wreck Venezuela’s economy; as if it needs their help! Smuggling across the border and of course food shortages in the country have been promptly blamed on private enterprise players “without scruples” and Colombians, carefully omitting Venezuela’s National Guard personnel, without whose alleged complicity, it is doubtful much would move across the border. Maduro subsequently closed the border crossing from Tachira, Venezuela to Norte de Santander, Colombia earlier this quarter. He also announced special emergency measures in 13 Venezuelan municipalities in proximity of the Colombian border. The shenanigans prompted an angry response form President Juan Manuel Santos, Maduro’s counterpart in Bogota. Both countries recalled their respective ambassadors in wake of the incident. However, in line with the prevalent theme of finding scapegoats, Maduro’s government didn’t stop there. Nearly 2,000 Colombians have been deported from Venezuela, according newspapers here. Another 20,000 have fled back to Colombia, something which President Santos has described as a humanitarian crisis. Santos also chastised Venezuela at the Organisation of American States (OAS) noting that Caracas was blaming its “own economic incompetence on others” (translating literally from Spanish). The Colombian President might well have felt aggrieved but he need not have bothered. The chiflados in Caracas know what they are. For example, when Venezuela was hit by an outbreak of chikungunya (last year), a disease marked by joint pains and bouts of fever according to the WHO website, the government’s response was as removed from reality as it currently is when it comes to DollarToday and smuggling across the Colombia-Venezuela border. At the time, a group of doctors west of Caracas calling for emergency help saw their leader accused of leading a “terrorist campaign” of misinformation. With a warrant was issued for his arrest, the poor man fled the country. Close to 200,000 were affected according media sources outside of Venezuela but government statistics put the figure below 26,500. Each time economists and independent analysts challenge any data published by PDVSA or INE or any Venezuelan government institution, it is dismissed by Caracas as “politically motivated.” And so the story goes with countless such examples, albeit an international spat like the one with Colombia are relatively rare. Maduro is also miffed with neighbouring Guyana at the moment, for allowing ExxonMobil to carry out oil exploration in “disputed waters” which prompted a strong response at the UN from the latter. Expect more nonsense from Caracas as the Venezuelan election approaches. However, here’s one telling fact from Colombian experts to sign off with – over the past year the Venezuelan Bolívar’s value has plummeted by 93% against the peso in the unofficial market. Now that’s something. The Oilholic tried to change pesos for the bolivar officially in the Colombian capital, but found few takers and got lots of strange looks! That’s all from Bogota for the moment folks as one heads to Peru! Back here later in the month, keep reading, keep it ‘crude’! To follow The Oilholic on Twitter click here. To follow The Oilholic on Google+ click here. To follow The Oilholic on Forbes click here.